I bought the repair kit for my Tannoy C8 and I am very satisfy with the quality of the product. Easy to install, the result is super. Thanks Simply speakers. 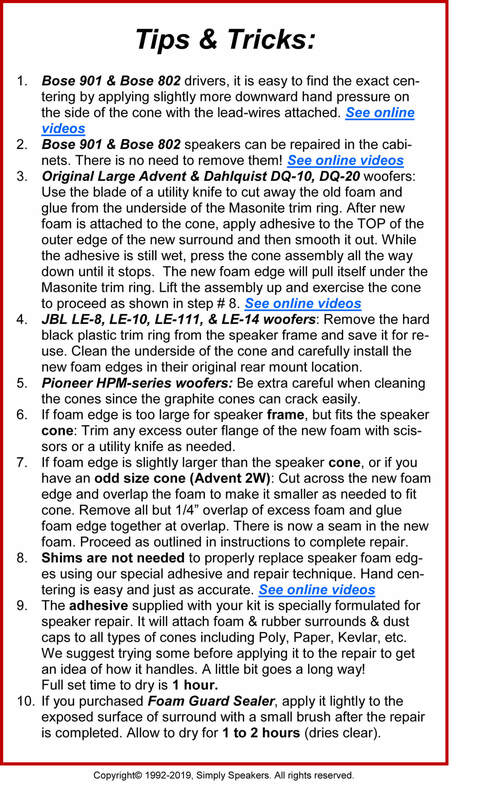 So glad I thought to google "foam repair Tannoy ybm 8". This repair/replacement kit for the surrounds was so easy to install. I started into it after work one day and was listening thru them before I went to bed. I let each glue stage dry for at least an hour. I used a bowl and then a plate from the kitchen to distribute pressure on the drying glue. Repair kit arrived quickly. Instructions were clear and easy to follow. I was able to prepare the speakers and install the new foam rings with little effort. In less than an hour both speakers were as good as new and sounding great. This kit worked perfectly. 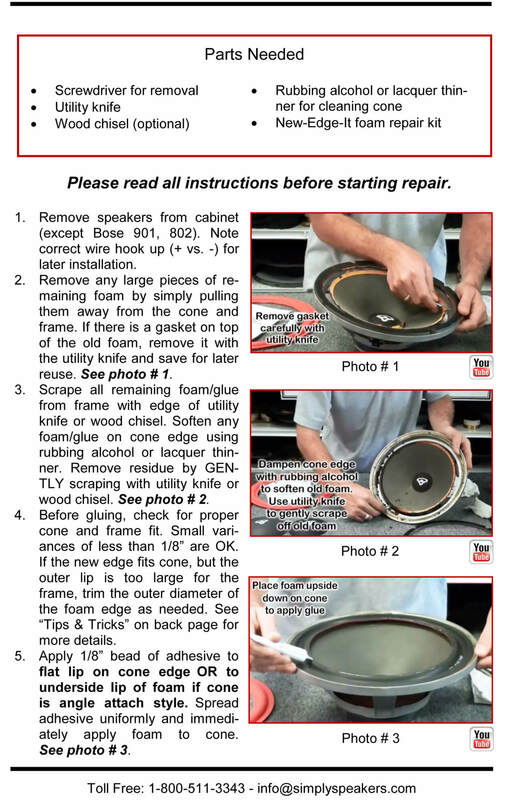 I used the FSK-8 kit to repair my Tannoy PBM-8 speakers. They sound great again! I had 8 Tannoy drivers that needed new surrounds. Intalled all 8 surrounds and the repaired speakers all work. I did fabricate a plywood (1/2") ring and plywood (1/2") disc, on my CNC, to use as a means to clamp the surround while the glue is drying. Getting the old glue off the rim was more tedious than expected. As an extra safety measure, I made a wooden clamp around the speaker magnet with a couple of 2X3 pieces of wood and CNC'ed round hole, plus some threaded rods to tighten the clamp so I could use two hands to remove the old surround and its glue. Works fantastic, speakers are like new. 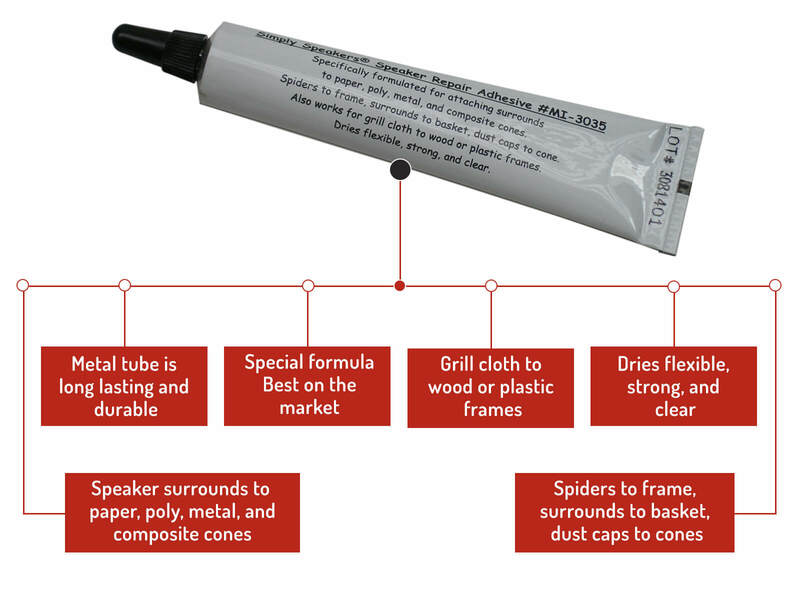 As in the demo video, go easy with the glue, and take your time with it. Thanks, saved me buying a new set of speakers. 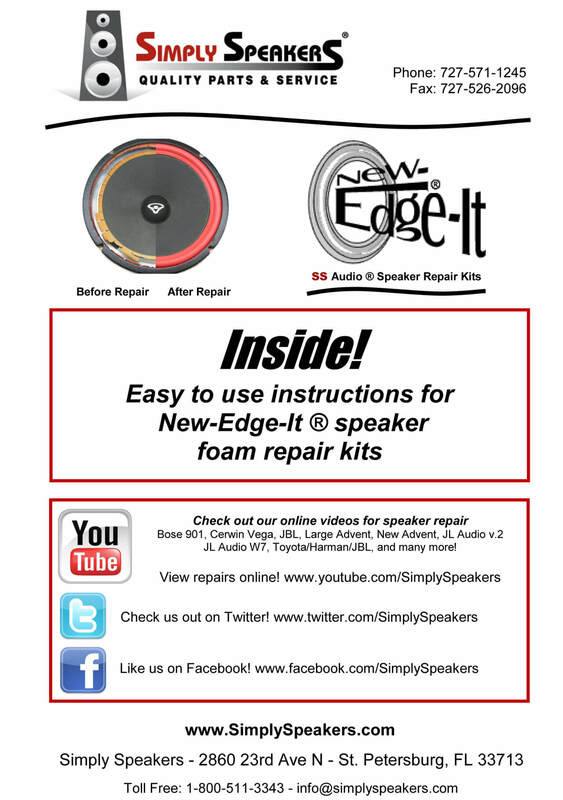 I received the speaker repair kit promptly in good order. The instructions were excellent. Everything fit perfectly and worked out great. The glue works very well with enough time to work it while drying rapidly. 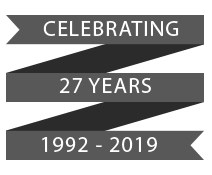 My speakers sound just like new and ready to go for another 25 years. I wish all transactions could go so smoothly. I had been hearing a low level distortion, buzzing sound in my home studio speakers for a while. Funny, I blamed everything else as a possible source, except the speakers! When I took off the speaker covers, I could clearly see that the foam rings had deteriorated. Thought the entire speakers would have to be replaced ($$$). Did some online research and discovered SimplySpeakers. 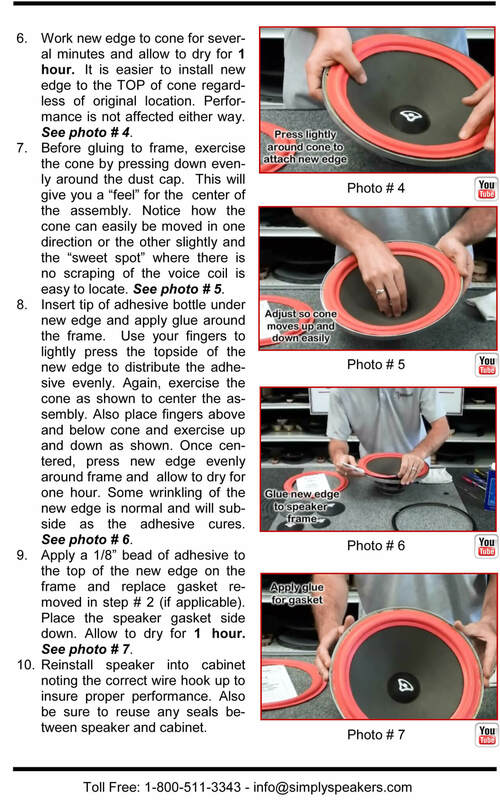 Watched the online video to see what was involved in replacing the foam rings. The video was well presented, and I decided I would take on this resoration job. I ordered my replacement kit, and they were delivered in just ten days. The proceess was well explained in the supplied paper notes, and the previously watched online video. Did the complete repair in one evening. Now my speakers sound brand new. Awesome! 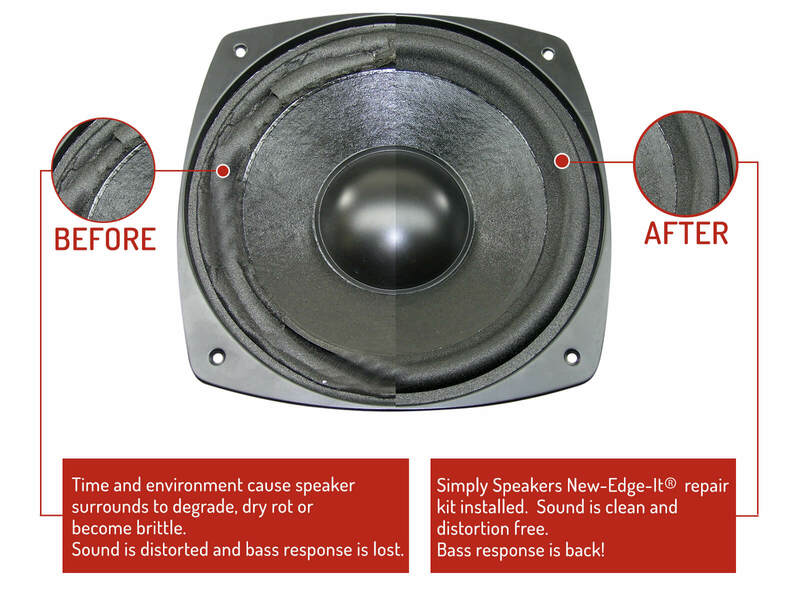 Plan to order replacement foam rings for two other pairs of speakers I have that need this fix as well. Great company! 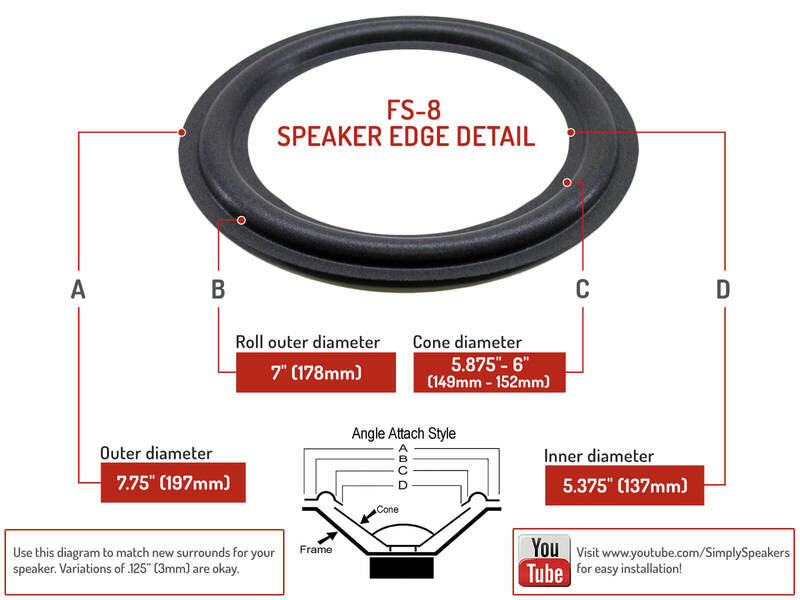 Q: Hi do you carry the rubber ring that goes around the outside of the surround for the tannoy pbm 8? A: Yes. 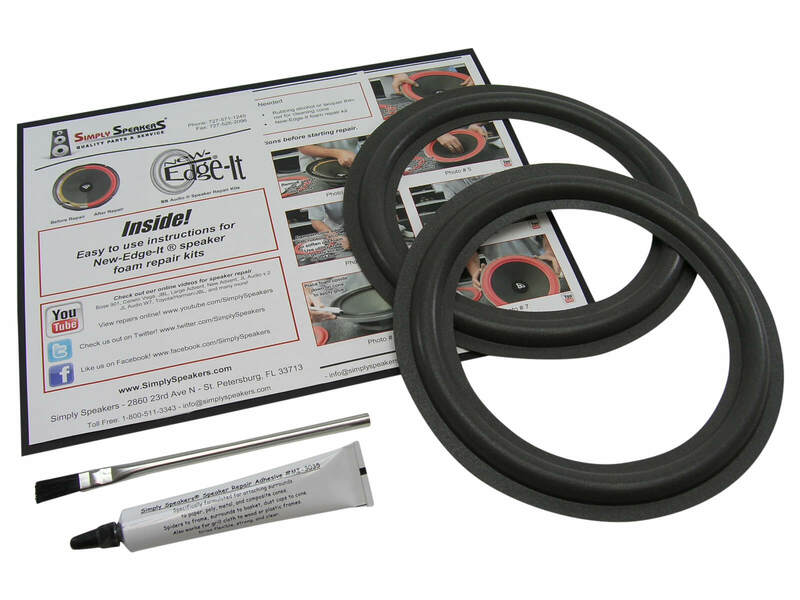 Please order kit # RSK-8 rubber edge kit for the PBM-8. A: Yes, this kit will repair the Tannoy NFM-8 monitors. 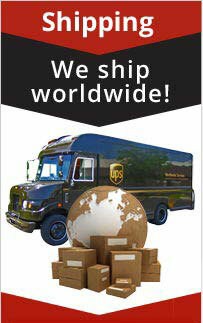 Tannoy: PBM-8, PBM8, C-8, C8, C-88, C88, MK-2, MK2, and many more!